Also, the review category, "Suggested Edits" is in a bold font, which also is unusual. Clicking on the category with the red dot first brought up an edit to be reviewed (which I did) but later brought up nothing. What is the significance of the red dot and bold lettering? "Suggested Edits" has a low threshold to light the red dot, 3, and it was hit that day. You may have not seen 3+ cases due to caching issues mentioned in the linked topic. Why don't we ever see others?, See the threshold table, those numbers, even for small sites are higher that what you usually find in the review. Even the one observed by you will not be so frequent. 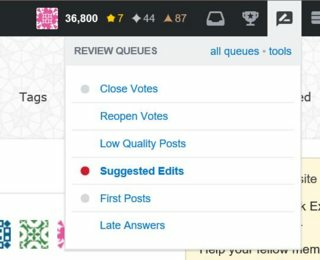 How do I change my review vote?